4894 V/VI E. EL. P. 1912, both values, fresh colors and in perfect condition unused with original gumming and clean small hinge. Michel 1030,- €. 4895 VI/I 20 Pfg. E. EL. P. 1912 with very rare overprint variety \"comma in lieu of dot to EL. \", from lower margin, in perfect condition mint never hinged and very well perforated, wonderful fresh colors. An exception copy for the highest standards! Photo expertize \"perfectly quality\" Brettl BPP. 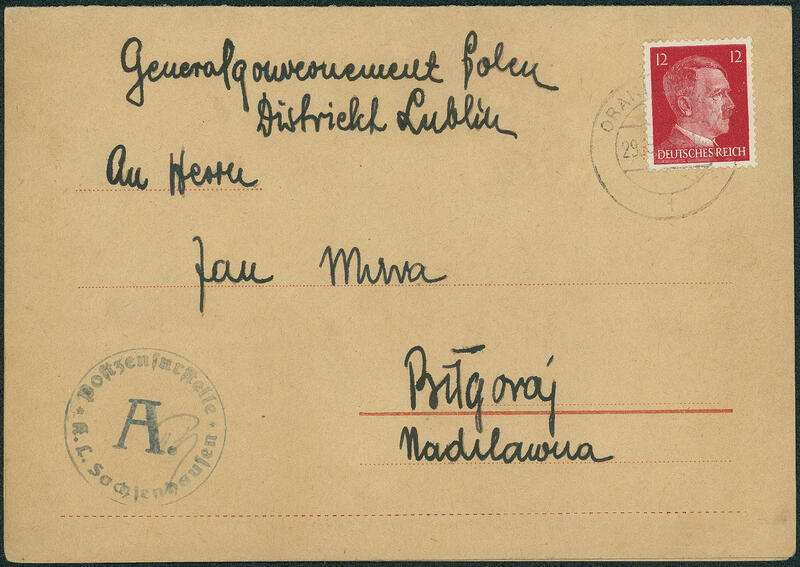 4913 ✉ \"SACHSENHAUSEN\", letter-card from the concentration camp with 12 Pfg. 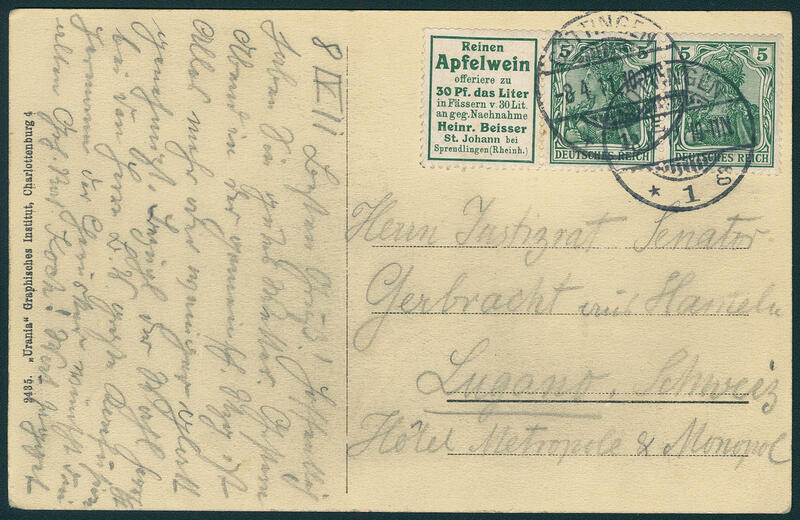 Hitler and two ring cancel \"ORANJENBURG 29.6.43\" with censorship stamp \"postal service censorship place KL. SACHSENHAUSEN A\". 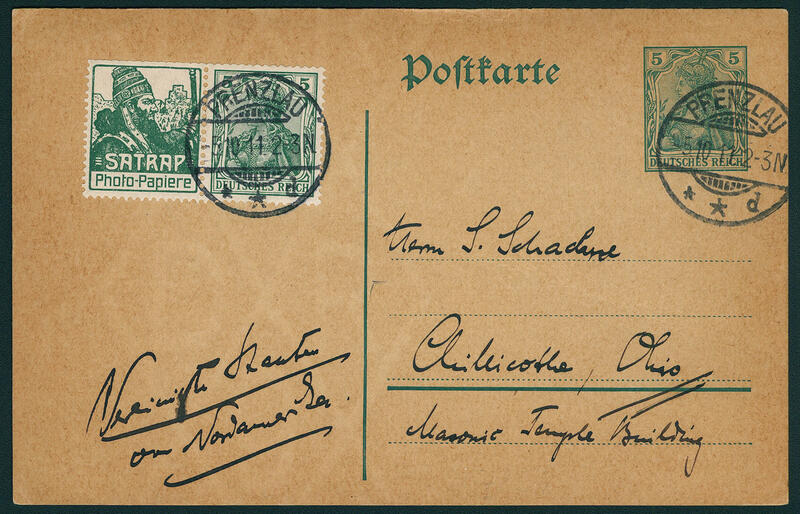 4914 ✉ \"SACHSENHAUSEN\", letter-card with twice 6 Pfg. Hitler and two ring cancel \"ORANJENBURG 1.5.43\" with censorship stamp \"postal service censorship place H. L. SACHSENHAUSEN H. \" to Thorn. 4953 ✉ W2.1 Cider Beisser - 5 Pfg. Germania, rare horizontal se-tenant, in perfect condition on nice picture postcard from \"GÖTTINGEN 8.4.11. 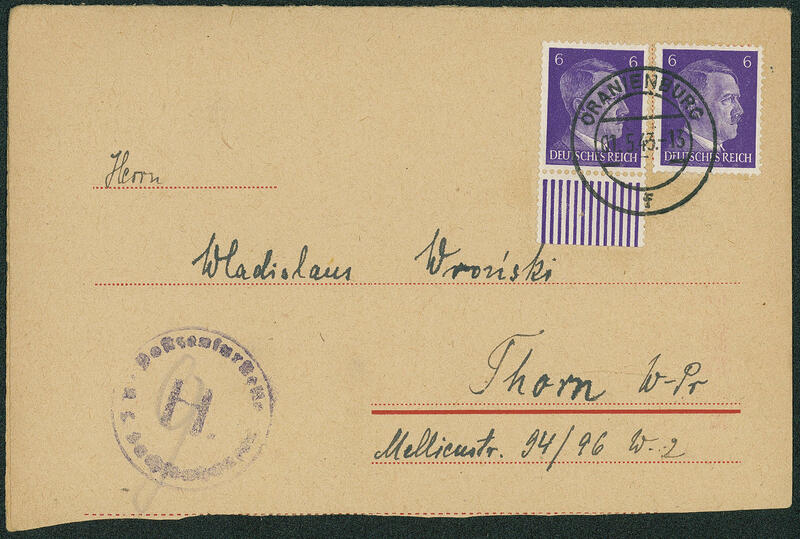 \" to Lugano / Switzerland, correctly franked used. This se-tenant is on documents rare to find, as foreign country use a rarity! 4954 ✉ W2.1,W2.2 Cider Beisser - 5 Pfg. Germania and bee honey Gühler - 5 Pfg. 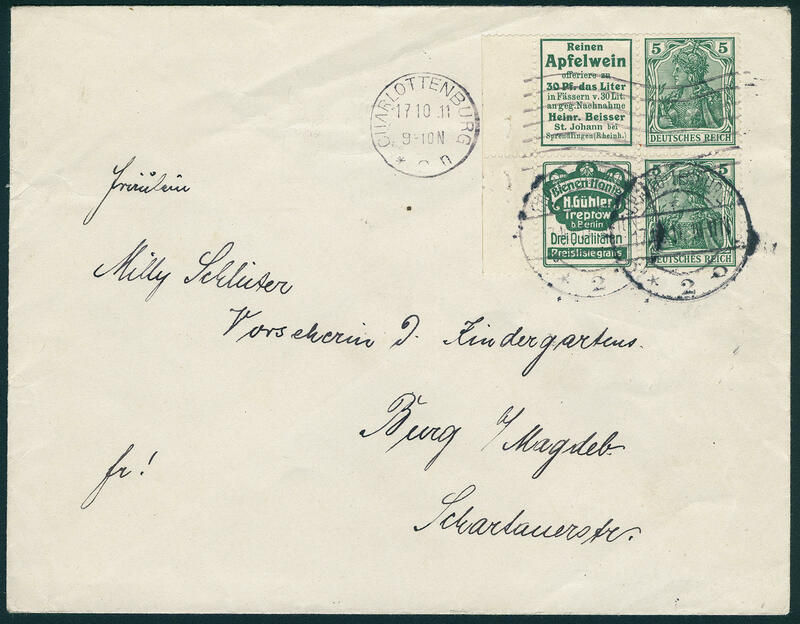 Germania, two horizontal se-tenants se-tenant with margin, in perfect condition on correctly franked cover from \"CHARLOTTENBURG 17.10.11. \" to castle. Interestingly enough was the se-tenant with the machine cancel from Charlottenburg cancelled. There the lower pair only extension manner used was, was it from a correct Prussian official additional with the bridge cancel from Charlottenburg used in this kind an unique cover! 4955 ✉ W2.2 Bee honey Gühler - 5 Pfg. 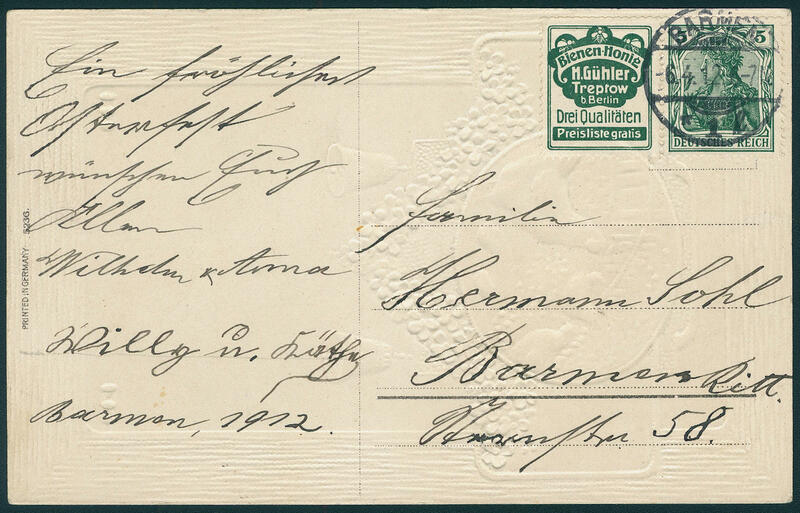 Germania, horizontal se-tenant, wonderful fresh colors on correctly franked franked picture postcard with very fine mounted stamp \"BARMEN 6.4.12. \" in the local usage used. A wonderful document! 4956 W2.3 Gewerkschaft Quint - 5 Pfg. 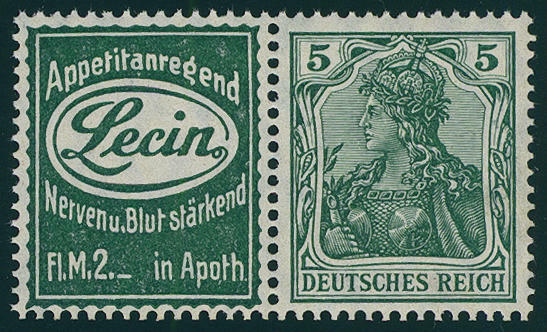 Germania, horizontal se-tenant from left margin, fresh colors and in perfect condition mint never hinged, without any signs. In this quality rare offered! 4957 W2.4 Lecin - 5 Pfg. 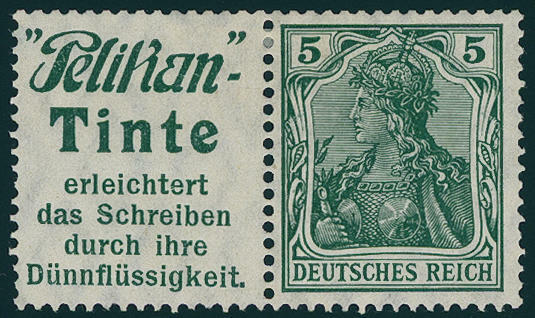 Germania, horizontal se-tenant, unfolded, in perfect condition mint never hinged, without any signs. Outstanding quality! 4958 ⊙ S1.7 Cider Beisser - 5 Pfg. 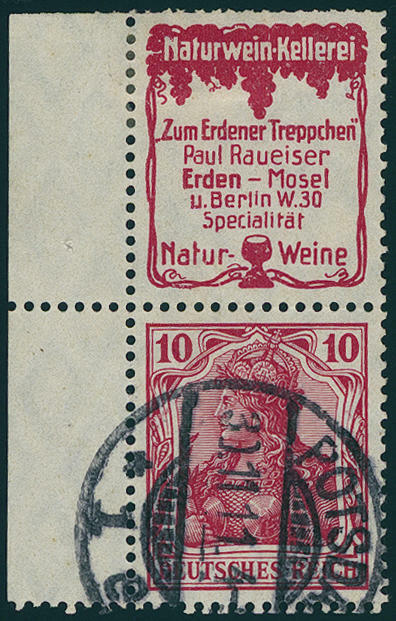 Germania, vertical se-tenant from left margin of sheet, fresh colors and neat cancelled \"MAGDEBURG 1.11.13. \". Photo expertize \"faultless condition\" Jäschke-Lantelme BPP. 4959 S1.10 Stamps Paul Pohl - 5 Pfg. 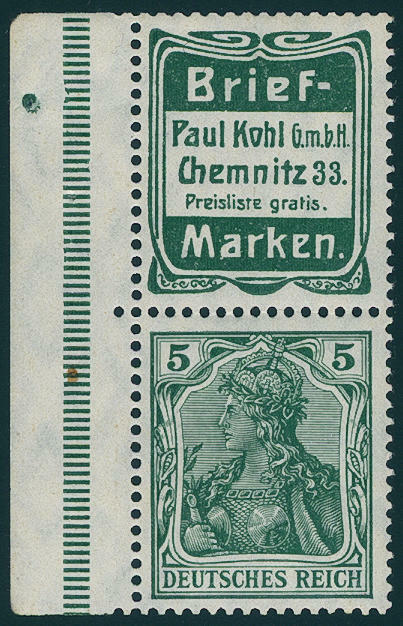 Germania, vertical se-tenant, fresh colors and in perfect condition unused from margin of sheet. 4960 ✉ S1.13 Photograph paper Satrap-5 Pfg. Germania, vertical se-tenant, fresh colors and in perfect condition as correctly franked on picture postcard from \"HEIDELBERG 27.3.12. \" to Engers. Rare! Michel 1600,- €. 4961 ∆ S1.16 Synoptical tables - 5 Pfg. Germania, vertical se-tenant from margin of sheet on magnificent letter piece, perfect used \"CHARLOTTENBURG 8.2.13. \". An especially nice copy this rarely se-tenant! 4962 S2.10 Stamps Paul the cabbage - 10 Pfg. 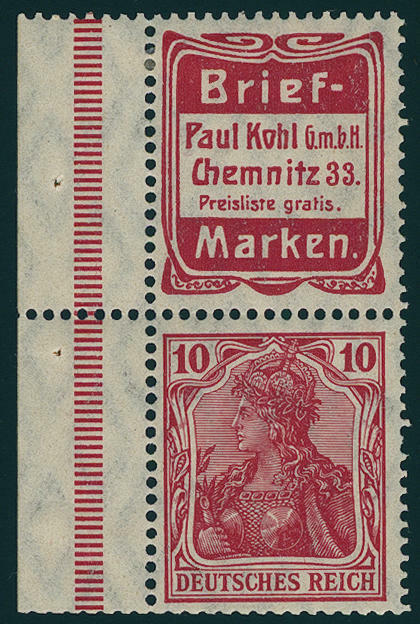 Germania, vertical se-tenant from left margin, fresh colors and in perfect condition unused. Photo expertize \"perfectly quality\" Dr. Oechsner BPP. 4963 ⊙ S2.19 Natural wine winery Raueiser - 10 Pfg. 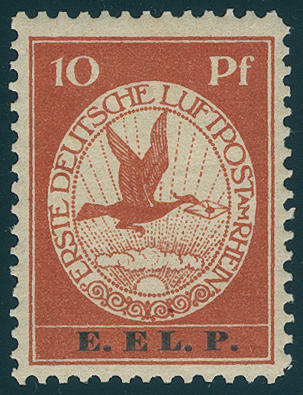 Germania, vertical se-tenant from left margin of sheet, fresh colors and in perfect condition, neat cancelled \"POTSDAM 30.11.11. \". Photo expertize \"perfectly quality\" Dr. Oechsner BPP. 4964 ✉ W2.2 Bee honey Gühler - 5 Pfg. 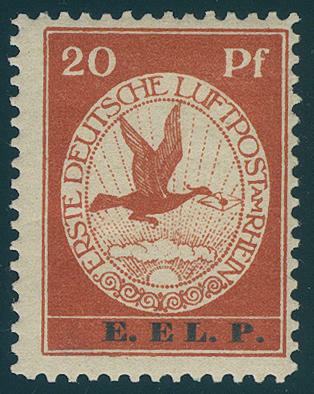 Germania, horizontal se-tenant from margin with additional franking 20 Pfg. 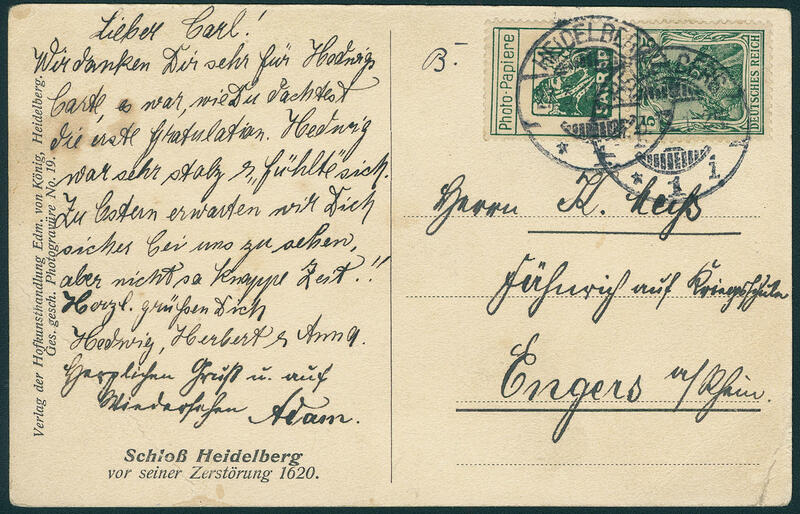 (2) on correctly franked registered cover from \"REUTLINGEN 13. April 18. 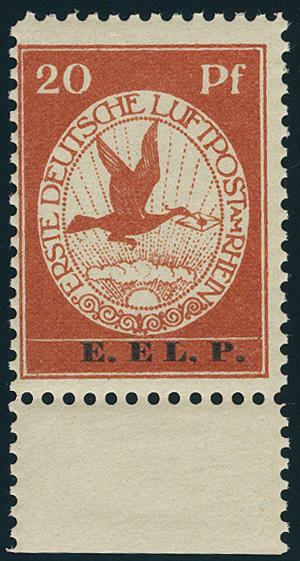 \" to Leipzig with arrival postmark. Rare! 4965 ✉ W2.4 Lecin - 5 Pfg. 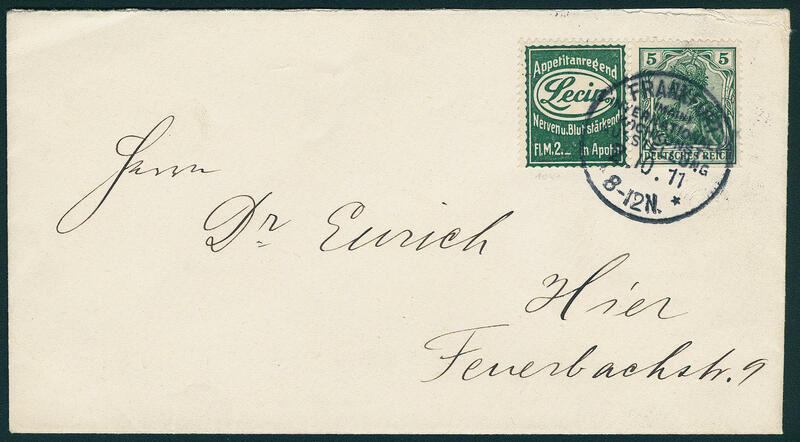 Germania, horizontal se-tenant, wonderful fresh colors on very nice, correctly franked local letter with special cancel \"FRANKFURT international art of cookery exhibition 2.10.11. \". Very decorative and rare! 4966 ✉ W2.5 Gewerkschaft Quint - 5 Pfg. With 5 Pfg. 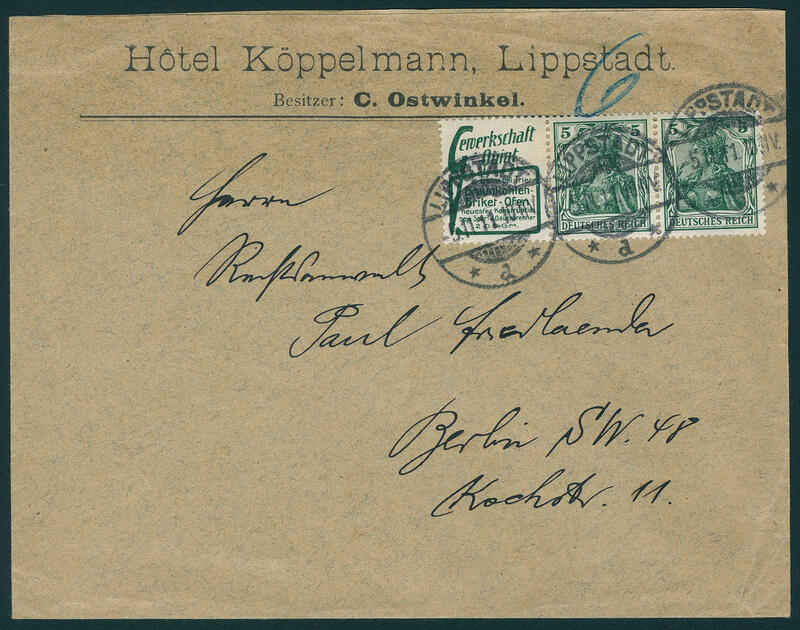 Germania, horizontal se-tenant, fresh colors and in perfect condition on very nice, correctly franked cover from \"LIPPSTADT 5.11.11. \" to Berlin. An attractive and rare document! 4967 ✉ W2.8 Satrap photograph papers 5 Pfg. 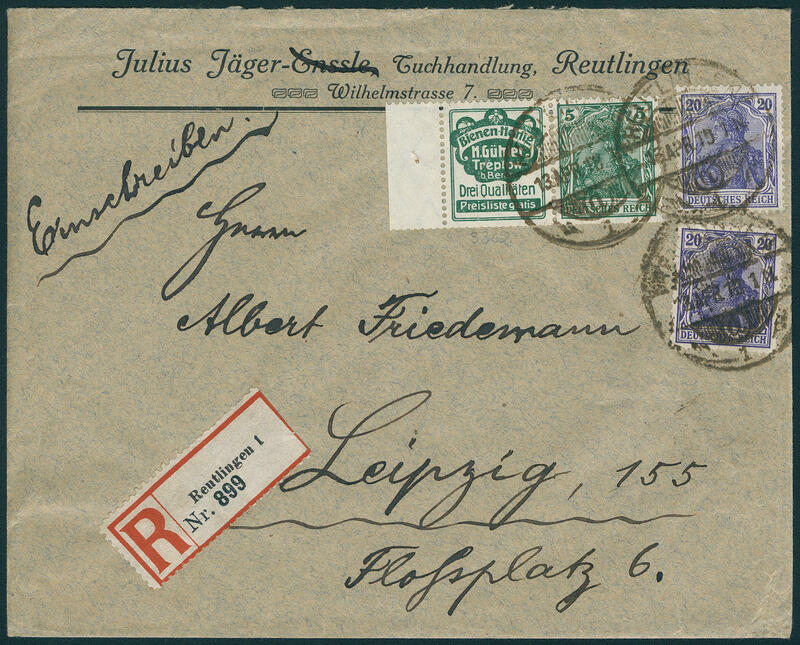 Germania, horizontal se-tenant fresh colors as additional franking on postal stationery 5 Pfg. 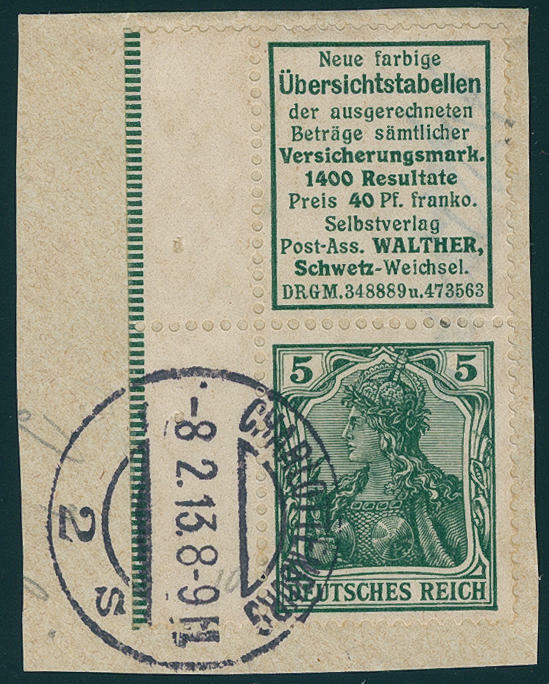 Germania, correctly franked used with two clearly postmarks \"PRENZLAU 5.10.11. \" to the United States. Very rare! Michel 1450,- €. 4968 W2.9 PELICAN INK - 5 Pfg. 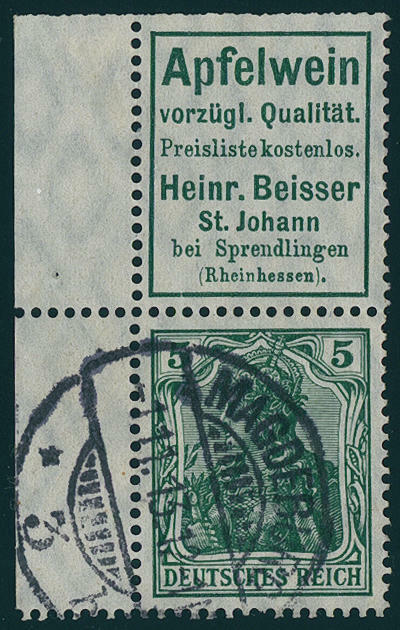 Germania, horizontal se-tenant, fresh colors and in perfect condition unused with original gumming. Michel 750,- €.